Skin is completely transparent and works on surfaces that are also transparent; you can place Skin on a glass surface and interact with content displayed under the glass. This unique hardware operates via a grid of nanowires embedded Skin’s polymer film. Each time a user makes contact with the surface, either by blowing on it or directly touching it, “a small electrical disturbance is detected allowing the micro-processor controller to pinpoint the movement or direction of the air flow,” according to Displax. 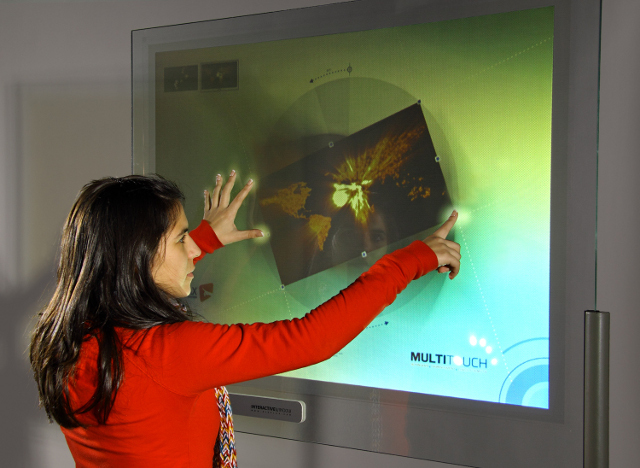 via Miracle Film Turns Any Surface into a Touchscreen.